I'm up reaaaaaaaaaaaaaaallllllllllllllllyyyyyyyyyyyyy late, as usual, and thought to myself, "why don't I update my blog, since there's nothing else better to do at 3:30 AM!" So, that's what I'm gonna do. Get ready... here come the super-posts! Last weekend was the 16th Annual Walt Disney World Marathon Weekend. What fun it was, as always! This was my fifth year as a volunteer Team Leader. Not only did I get to volunteer at the Expo on Friday, but I also got to be a Team Leader for about 50 people on Saturday! That was cool. My crew on Sunday out in Epcot's Wonder Lot consisted of a total of about 160 volunteers and I was lucky enough to have some of the same folks from last year again. I was in charge of Bag Check and Gate Control, as always, and it was a good time. A little more hectic than usual as the day progressed and I ended up with 24 bags to take to Lost and Found. Not the worst, but surely no record. As always, 14 hours in that parking lot was a long time, but well worth it. I love volunteering for the Marathon. Next year may be a little different, as I think I'm gonna be crazy and actually run it... 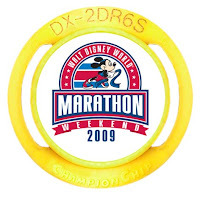 I'm already prepping my resolutions for 2010 - one of them being "run every Disney road race I possibly can". Keep your fingers crossed for me!